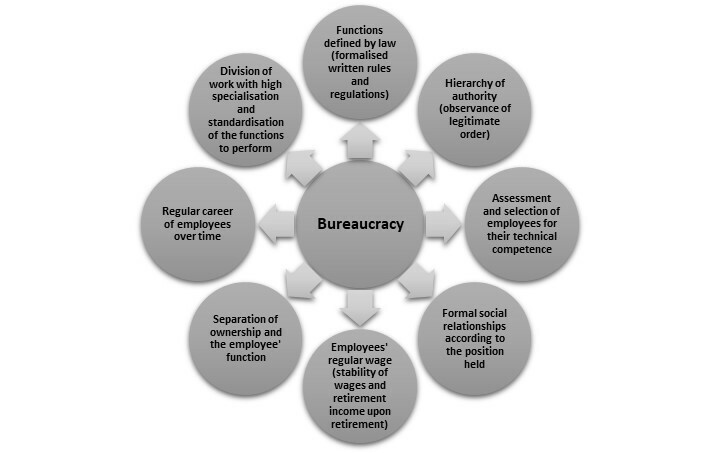 Bureaucracy has very specific features that differ, in varied situations, from the representation and application often ascribed to this model of organisational administration. Following Serpa & Ferreira (2019), rationalisation boosted the project of modernity by enabling the application of the general principles of reason to the conduct of human problems, fostering the ability to respond to unstable environments and to manage the inherent complexity (Touraine, 1988; Clegg, 1990; Weber, 1966, 1982). Rational action aimed at controlling uncertainty; rational calculation would limit uncertainty in a world that could be controllable. Two conceptions of rationality are put forward by Weber. “Formal rationality” regards the means-end relationship and the accomplishment of practical and indisputable ends, through a precise calculation of the means adapted to the attainment of those ends. “Real rationality” concerns the increasing theoretical dominance of reality through increasingly precise and abstract concepts (Clegg, 1990). “Precision, speed, clarity, knowledge of the archives, continuity, discretion, unity, strict subordination, reduction of friction and costs with material and personnel – are brought to the optimum level in the strictly bureaucratic administration, especially in its monocratic form [.] bureaucracy is “dehumanized” insofar as it manages to eliminate from official business love, hate, and all the personal, irrational, and emotional elements that escape calculation. This is the specific nature of bureaucracy, praised as its special virtue” (Weber, 1982 , pp. 249-251). Bureaucracy may be seen as being embedded in a process of formalisation, that is, a way of redefining, reinterpreting reality and reclassifying its elements, focused on increasing the capacity for control and direction, enabling the extension of the modern institutions’ field of action. Homogenisation favours homogenising the different, imposing order and eliminating ambivalence in the name of reason and through bureaucratic control. Homogenisation of structures, cultures, and outcomes of modern institutions that seek to rationally manage the contexts in which they operate, which are characterised by uncertainty and constraint, emphasises the similarity of forms, strategies, and processes of modern institutions, aiming for legitimacy (Wagner, 1997). Source: Adapted from Ferreira et al., 2004, pp. 24 and 25. However dysfunctions emerge in the functioning of the bureaucratic organisation (Filleau & Marques-Ripoull, 2002; Cour, 2018), in the interpretation of the law (Pimentel, 2012), as well as the informal dimension, which “tend to originate a large number of unofficial forms of acting. In part, this takes place because the lack of flexibility can be gained by unofficial adjustments of the formal rules” (Giddens, 1997, p. 355). Ultimately, the rule functions as an end in itself (Giddens, 1997; Branco, 2016). A reifying conception of the notion of bureaucracy implies that it is a condition that is present or absent, assuming that organisations are either totally bureaucratic or non-bureaucratic, obscuring a perspective that emphasises bureaucracy as a form of organisation that exists across a number of dimensions, each one in the form of a continuum (Hall, 1966; Ang, 2016 ). Note: Text based on Serpa, S. & Ferreira, C. M. (2019). For further development see this text. Clegg, S. (1990). Modern organizations: Organization studies in the postmodern world. London: Sage. Ferreira. J. M. C. (2004). Abordagens clássicas [Classic approaches]. In J. M. Ferreira, J. Neves, & A. Caetano (Coords.) Manual de psicossociologia das organizações [Handbook of psychosociology of organisations] (pp. 3-27). Lisboa: McGraw-Hill. Filleau, M. G., & Marques-Ripoull, C. (2002). Teorias da organização e da empresa: Das correntes fundadoras às práticas actuais [Organisation and company theories: From foundational currents to presente-day practices]. Oeiras: Celta Editora. Giddens, A. (1997). Sociologia [Sociology]. Lisboa: Fundação Calouste Gulbenkian. Pimentel, D. (2012). Sociologia da empresa e das organizações. Uma breve introdução a problemas e perspectivas [Sociology of de company and organisations. A brief introduction to problems and perspectives]. Lisboa: Escolar Editora. Touraine, A. (1988). Modernity and cultural specificities. International Social Science Journal, 118, 443-457. Wagner, P. (1997). Sociología de la modernidad [Sociology of modernity] Barcelona: Herder. Weber, M. (1966). Os fundamentos da organização burocrática: Uma construção do tipo ideal [The basics of bureaucratic organization: A construction of the ideal type]. AAVV. Sociologia da Burocracia. Rio de Janeiro: Zahar Editores. Weber, M. (1982). Ensaios de sociologia [Sociology essays]. Organisation and introduction by H. Gerth and C. Wright Mills. Rio de Janeiro: Editora Guanabara.